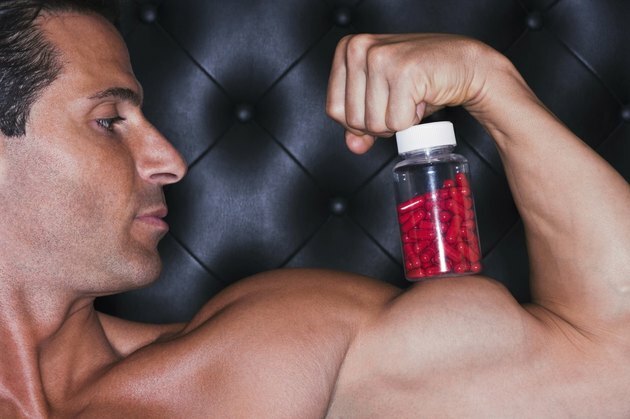 How Much L-Arginine Can You Take per Day? L-arginine is classified as an essential amino acid, meaning your body cannot produce it on its own. L-arginine and arginine are interchangeable terms. Your body uses this amino acid for a variety of purposes, including boosting immune system function and improving blood flow. You obtain this amino acid through diet, medication and/or nutritional supplements. Dietary sources include meat, dairy products and fish. Consult your doctor before trying arginine supplements. According to MedlinePlus, arginine medicines and supplements may be effective for treating several health conditions and for improving exercise capacity. The site notes that arginine is possibly effective for congestive heart failure, bladder inflammation, erectile dysfunction and improving recovery following a surgery. In an article on the website NutritionExpress, Jeff S. Volek, Ph.D., R.D., states that there's evidence that consuming 6 g of arginine before a workout increases exercise capacity by as much as 26 percent. When you consume arginine from food sources or supplements, it gets converted to a chemical called nitric oxide. You can find nitric oxide supplements at fitness stores -- they are essentially L-arginine supplements marketed as nitric oxide supplements. The nitric oxide causes blood vessels to open, allowing increased blood flow through the body. In addition, MedlinePlus reports that it increases the release in the body of human growth hormone, or HGH, which plays a major role in muscle development. By consuming too much arginine, you may be putting yourself at a higher risk for bleeding. Arginine can be deadly in children when consumed in excess. The recommended dosage of arginine varies depending on the treatment. For congestive heart failure, MedlinePlus recommends doses ranging from 6 g to 20 g per day, which varies on a case-by-case basis. For relieving chest pain caused by clogged arteries, 9 g to 28 g of arginine is taken in equal increments three or four times daily. Men suffering from erectile dysfunction may benefit from 5 g of L-arginine per day. Dr. Volek mentions 6 g per day as an effective dosage for improving physical performance. Arginine supplementation may cause adverse reactions in some people, such as those with herpes, young children, patients with low blood pressure, or individuals about to have surgery. Common side effects of arginine supplements include stomach discomfort, diarrhea, worsening of asthma and low blood pressure. MedlinePlus notes that L-arginine supplements are generally safe for most people when consumed as directed by a doctor and according to the proper dosage recommendations. Can L-Arginine and Ginseng Be Taken Together?